The estate was founded in 1689 by Pierre de Mazure de Rauzan and the vineyard acquired its name a few years later when his daughter Thérèse received it as part of her dowry on her marriage to Jacques de Pichon Longueville, the first President of the Parliament of Bordeaux. It was divided upon the death of Baron Joseph in 1850 between his five children. However, only two of his children finally inherited the vineyards; Raoul and Virginie. Virginie married Count Henri de Lalande, giving her the title, and took over control of the domain. Her passion and the quality of her management made her a strong personality in the Médoc and she very much left her mark on the domain. 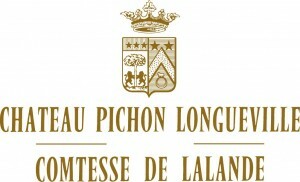 In the 1855 classification Château Pichon Longueville Comtesse de Lalande acquired the status of Second Cru Classé. The 75 hectares (185 acres) of this vineyard border the property of Château Latour and stretch south of Pauillac towards the Commune of St Julien, from whence it gets its extraordinary charm. The exceptional character of the wines produced here, are distinguished by their elegance and finesse. The average age of the vines is 35 years, the sub-soils are made up of deep layers of gravel, and the top soils are ploughed. All these factors work in favour of the terroir and the production of high quality wines. In these conditions the water constraints created by drought can generate higher wine quality, as long as the vine doesn’t suffer stress. A difficult start to the year with rain during flowering and a cool summer was, thankfully, saved by an Indian summer that created excellent conditions for the grapes, allowing them to reap the benefits of the late season ripening. A dense ruby/purple colour with a complex nose of cedar wood, spice box, blackcurrants, and smoke. Abundant plumpness and flesh on the palate. The texture is caressing, sensual and well-structured in the centre thanks to the tannins. The structure is long without any aggressiveness. The aromatic persistence is floral and spicy.